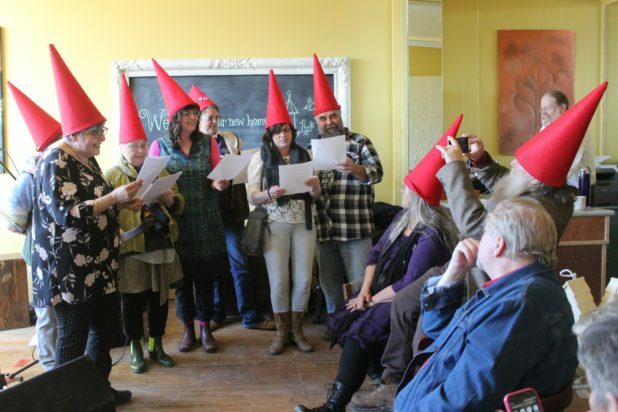 Since 2003, the North Hastings Community Trust has been actively fostering a communal atmosphere of togetherness throughout the Bancroft area. While settling into their new space at 23 B Bridge Street West in Bancroft over the past few months, NHCT’s program director Jane Kali said the organization’s potential to build community and help those in need has grown substantially. During this time, she has noticed how the new location has made it easier for people to access their services and connect with one another. Excited by the many possibilities the new space has already created, she described how it helped facilitate an encounter with a new NHCT supporter. “We had someone come in last week who does international consulting on sustainable transportation models,” Kali said. It has been a challenge trying to keep up with the growing support, Kali said. Unfortunately, considering the increasing number of people living in poverty in North Hastings, she said it has been equally as difficult to keep up with the level of need. Pointing out the sad economic realities in North Hastings, she said the average income in the area is a third lower than the provincial average, and that 38 per cent of children under the age of six years old. To tackle this challenge, Kali said NHCT is shifting away from a charity-based operational structure towards a more democratic model. Transitioning NHCT away from operating as a charity has been her goal since she began working there, she said. “We need to shift this machine away from the charity model towards one that is empowering our community, and particularly empowering people who are the most marginalized,” she said. “The impact on the community has been devastating,” said Kali. Stating that the crisis of poverty in North Hastings cannot be overcome by only a few people, Kali said the only way to stop this local tragedy from unfolding any further is by getting the community to work together. The best way to accomplish this, she said is to build a community where everyone takes care of each other when someone is in need. When a community faces a crisis, Kali said people tend to band together despite their political differences. NHCT has recently established a partnership with the Hastings-Prince Edward Public Health Unit, that is uniting people from all walks of life. Through this alliance, she said NHCT is now providing harm reduction care, operating an official needle exchange program and distributing naloxone kits to prevent potential overdoses. Furthermore, Kali indicated that there will now also be a sexual health nurse regularly on site for drop-ins. Kali said the partnership between the NHCT and the health unit came into being after attending a meeting with Bancroft’s community safety and well-being committee regarded an increasing number of discarded needles turning up in public parks. Rather than criminalizing these individuals by putting up security cameras to catch them, Kali said NHCT and the health unit agreed that the best way to solve the problem was to talk to the people using drugs to gain a clearer understanding of the type of support they need. The connections established from these different agencies working together have continued to flourish, she said, noting that many of the individuals present at the first meeting have been meeting regularly to develop a solution. In collaboration with public health, Kali said NHCT held a training session to better inform people in the community about the opioid crisis. They have also hosted a series of focus groups, engaging people who use drugs in order to incorporate their input into their strategy for harm reduction. Acknowledging that addiction impacts people’s lives no matter how much money they earn, Kali also recognizes that poverty adds another layer of difficulty to the struggle. “The middle class and the rich have way more options around dealing with their addictions, and their addictions are basically more acceptable,” said Kali. Whether assisting people in overcoming their addictions or eradicating poverty, Kali said the best course of action is essentially the same – listening to one another and helping each other when someone is in need. To foster a more connected and compassionate community, she said NHCT has started hosting a potluck lunch at their new space each Friday at 1 p.m. Everyone is welcome to attend, Kali said, whether they are able to bring food or not. To find out more about the North Hastings Community Trust’s programs and services and/or to get involved, drop by their new space in Bancroft, visit them online at www.northhastingscommunitytrust.org; or contact nhcommunitytrust@gmail.com.